Scotts® DiseaseEx™ Lawn Fungicide offers a formula to cover a wide range of problem lawn diseases. This new product is fast acting and continues to control lawns diseases for up to 4 weeks. Scotts® DiseaseEx™ controls common diseases like: Brown Patch, Stem & Stripe Rust, Red Thread, Powdery Mildew, Pythium, Southern & Typhula Blight, Pink Patch, Nercrotic Ring Spot, Summer Patch, Yellow Patch and more. Use on home lawns to prevent or control common diseases (see label for complete list of lawn diseases controlled). Use on home lawns to prevent disease (Preventative Rate Setting) before it appears and/or to control disease (Curative Rate Setting) at the first sign of disease. Do not apply more than 37 lbs. 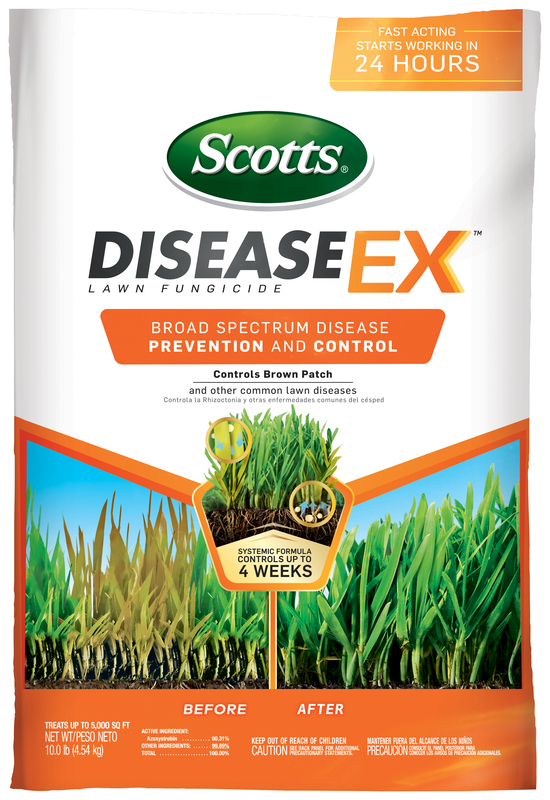 of Scotts® DiseaseExTM Lawn Fungicide per 1,000 sq. ft. in a single year. For best results, begin applications prior to disease symptoms, when conditions are favorable to disease, typically in spring. In order to protect estuarine/marine fish and aquatic invertebrates, do not apply directly to water, and avoid runoff. Do not contaminate water when disposing of equipment wash water or rinsing. Scotts No-Quibble Guarantee: If for any reason you, the consumer, are not satisfied after using this product, you are entitled to get your money back. Simply send us evidence of purchase and we will mail you a refund check promptly. For more details, click here. When used as directed, this product is safe to the lawn and controls the disease listed. Consult with your local Cooperative Extension Service office or your state's land grant university for assistance with lawn disease identification and specific fungicide timing in your area to control lawn diseases. People and pets may enter the treated area after application.